Much smaller than North Shore, Big Lake South features 23 RV and parking sites and 8 walk-in tent sites, 3 of which sit right on the lake! From mile 52.3 Parks Highway, take South Big Lake Road approximately 5 miles, cross the Fish Creek bridge, the park entrance is about 400 yards past the bridge on the right. 1- Medium tent site suitable for 1 medium or multiple small tents, waterfront, shaded. 7- * Sites 6 & 7 or 5 & 7 are often used by large parties or groups medium tent site suitable for 1 large tents or multiple small tents- DOES NOT HAVE PICNIC TABLE AND FIRERING. Parking Size; 9ft X 35 ft., gravel, full sun. There are a limited number of picnic tables and fire rings. 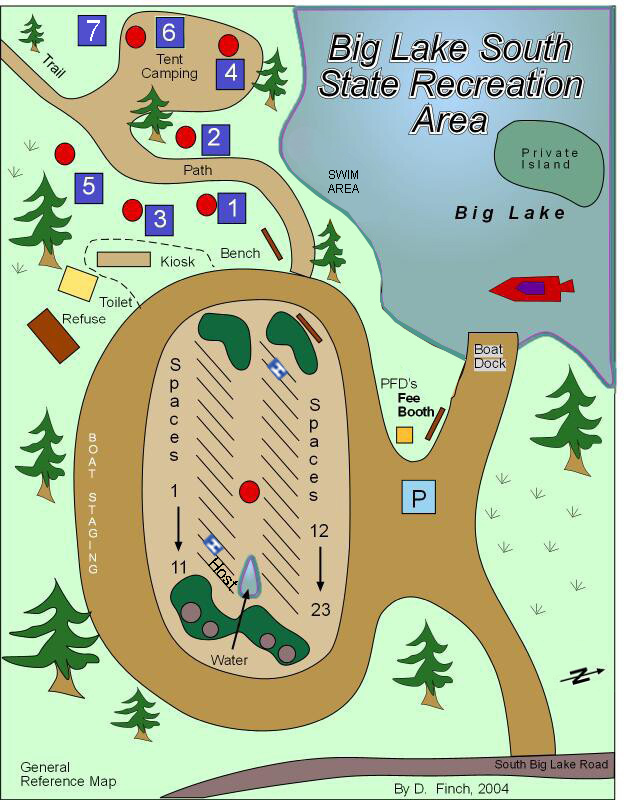 HANDICAP RV SITEs: 10 and 12 If party has no disabled camper they may be asked to relocate to another site. Parking Size; 9ft X 40 ft., asphalt, morning and afternoon sun.